How Generous Are We Americans? While we were in the States this past year, we had many opportunities to share about our community, our ministry, and our experiences outside the U.S. It was interesting to hear people talk proudly about how generous Americans are towards other nations. And in a way, we are. 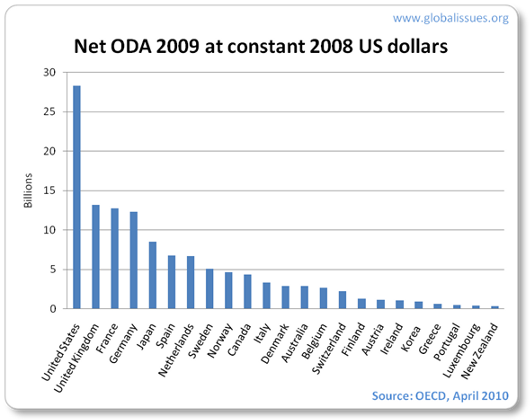 Looking at the U.S. government’s foreign aid in 2009, you see that it approached 30 billion dollars, more than double the totals of the next closest nations. 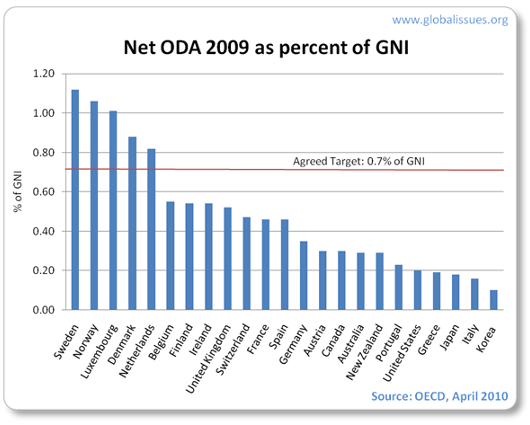 However, if you look at the sums as a percentage of Gross National Income, the graph tells a quite different story. Not only is the U.S. giving far below their target of 0.7% of the Gross National Income, but we are amongst the least generous of the world’s wealthiest nations. Tim Price You amerikans aren’t nearly as generous as many would like to think. Amerikan believers are passively greedy. Most could live comfortably on 30% of what they do. But most are chasing the same dream as the rank non-believer. As a whole the nation is manipulative and imperialistic, aid is only self-interest based. With the aid comes the strings attached. As far as I’m concerned there is no “we” in regard to Amerikans and people following Christ who live here. The two can never be congruous. It is true that we Americans can live off much less and be more generous. We Christians have no excuse for our lack of generosity. I plan on posting a few ideas related to Christian giving and citizenship in future blog-posts. However, I don’t think we can cast of our nationality or ethnicity so easily. To claim not to be an American is to pretend – to create an imaginary separation between person and people. While it may be a possible game of the imagination, it is fiction. If you vote, pay taxes or have citizenship, you are, in a legal sense, American. If you use highways and the internet, you are living off of America. There are also the ethnic and geographic features of American culture that one can’t simply cast off. When you use language in America, which is mostly but not exclusively English, you are indwelling a world shaped by cultural referents, values and paradigms for interpretation. You cannot disassociate from this by an act of the will. And by living in this particular place, absorbing minerals from this particular soil, breathing this particular air, buying and selling within this particular economy, and so on, you are shaped (physically, socially, etc.) by this geography. Of course there are real ways to not be American: renouncing citizenship, moving to a different country, etc. But even then you are still interpreting the other place and people from the American point of reference. As Christians, though, I don’t think we’re called to renounce America, but rather to contribute a particular type of “being” American that is defined and shaped by the Triune God through the church. Hauerwas’ “Resident Aliens” speaks well to this. David, thanks for posting my comment and them responding… Many attempt to “keep” the earthly connections they had before Christ. This is simply unbiblical. We are the kingdom of God and this is a total differentiation from being part of the kingdoms of men (at least for us). Of course mere men still see and recognize our former connections just as they did with Paul. This is why he used his citizenship the way here did. However, the language that describes the beleivers is always in terms of not belonging; servile terminology of which there are more than 100 references, ambassador, stranger, soldier, sojourners, athlete…totaling nearly 230 such references. All these depict a “not belonging” status within a realm around us. II Corinthians 5:17 tells us if we are “in” Christ “all” things are new. What is not part of the “all.” The answer is absolutely nothing. Phil. 3:2-11 states 7 things which Paul counted as “dung” which include nationality and political belonging. Then comes the stinger. He says that we CANNOT gain Christ until or unless we do the same. Now for the soft sell evangelicals and institutional church folks this is a tough sell. But the original language supports it not to mention early church experience. The Constantinianization of belief has clouded the issue for many. However, those who are followers of Christ in persecuted places know exactly what I am saying. Liberal theology types want the world to be a better place and so they wont admit this radical part of the gospel. If we are really “new” in Christ and not just believing in a belief, form follows function. If not, then we have what we have and there is nothing to not or complain about. Egalitarianism can only be reached within the body of Christ. Unregenerate man broad based cannot do this and we are foolish to try and train them so. This world will never be better than when and where beleivers (true) beleivers exist. We are people without belonging in order to be God’s people wherever He would send us and have us work towards His purposes. Many believers never reachout because they think they’re “regular” believers instead of God’s believers which do not belong. They live like the world because they are still of the world. The evangelist, pastor and teacher need to go back to the entire gospel, equip people to be “non-belonging” kingdom citizens. They ought to stop building buildings for themselves and cortening themselves off in religious covens away from others and the world. Just think if all “church” buildings were cashed in and the money was used to actually minister and finance kingdom work that met needs and kept us as non-belonging kindom people?